National Nest Box Week runs from 14th – 21st February and to celebrate, we’ve written this guide on how to make, put up and monitor a Little Owl nest box. Little Owls start prospecting cavities for nest sites in March, so February is a good time of year to erect a box for them in time for the forthcoming breeding season. Please get in contact with the UK Little Owl Project if you'd like further advice or would prefer to buy a ready made Little Owl nest box. It’s best to choose a site close to a Little Owl sighting to maximise your chances of box occupancy by Little Owls. To begin with, we recommend that you read our Little Owl Spotters' Guide for identification tips and advice on where you can find this owl. Little Owls can be spotted in isolated trees, hedgerows and on barns close to agricultural land. They prefer a patchwork of habitats, with mature trees, fence lines, hedgerows, grazed and rough grassland, and open-sided buildings. Little Owls roost and nest in Ash, Beech, Oak, Willow and mature fruit tree hollows, and within farm buildings. In Wiltshire, we tend to find Little Owls in rural villages, and near smallholdings and livestock. On a sunny day, their distinctive silhouette can be seen within trees and on roofs. Listen out for their calls - territorial males are increasingly vocal right now - you can hear an example of their 'kweew, kweew...' call here. They're especially vocal at dusk. It's important to seek landowner's permission before you visit a prospective site or erect a nest box. Please ensure that you are responsible and safe. We recommend the field tested ‘Bob Sheppard Little Owl nest box’. We like Bob’s box design because it prevents nestlings from leaving home too soon, it’s simple to make, it has a tunnel entrance and dark nesting chamber, the 70mm entrance hole excludes some predators of Little Owls, it’s easy to clean out and monitor, and if required, it can be modified for outdoor use. Click here for Bob’s Little Owl box template for indoor use in farm buildings. 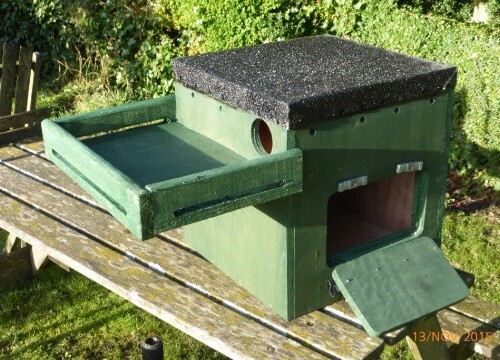 To weatherproof a box, build it using 12mm Marine plywood, use rustproof screws, treat wood with wildlife friendly creosote substitute, drill 4x10mm drainage holes in box floor, drill 2x10mm holes in box sides for ventilation, and put felting on the roof. We add a perch or 'landing strip' platform under the entrance hole to make it easier for juveniles to re-enter the box. This can help them to evade predators and wet weather during the critical fledging period. Add drainage holes to platform to prevent rainwater entering box. You can modify Bob’s box design for your local area. We’ve increased our box size by 50% to accommodate broods of 4 and 5 chicks – this gives them more room to exercise before branching, and we find that larger boxes are drier inside. Juvenile Little Owls produce lots of mute, especially during wet weather when they eat more worms. Finally, we've side positioned our box check hole and fixed the hinge in a horizontal position to accommodate the front platform. You can erect your box in a tree or open-sided building. Find a site where Little Owls aren't going to be disturbed. Don't put your box up close to woodland; Little Owls like isolated trees and tree lines, whereas the Tawny Owl is a woodland species, and will predate Little Owls. If you're putting up more than one box, keep a distance of at least 1 km between boxes to reduce competition between pairs. Erect your box vertically and 3-4 metres above ground level; you might have to erect your box higher in a building. Choose a box position which considers the needs of branching young - they need branches, vegetation, beams and/or walls in close proximity to box entrance. Little Owls need a clear view to the box entrance hole; you might have to trim back ivy some years. We recommend Timberlock screws to fix your box in place. Once sited, add an inch of wood chippings, but never sawdust, in the bottom of your box. We'd love for you to let us know if you've put up a Little Owl nest box. Sometimes, Little Owls find and occupy a box straight away. It usually takes Little Owls a few years to find a box, and there are no guarantees that it will be used. A well made box can last for 10 or more years; you should maintain it by an annual 'check and clean out' visit during February or March. This involves removing old nesting material (pellets and mutes) from inside the box. Replace the wood chippings if they are damp, and remove pellets and vegetation from entrance hole and inside the tunnel. You can register and monitor your nest box via the British Trust for Ornithology's Nest Box Challenge Project or Nest Record Scheme. It's important to carefully follow the BTO's nest monitoring handbook. You can learn all about the Little Owl's courtship behaviours and breeding cycle here. We're always happy to give advice; you can contact us here.